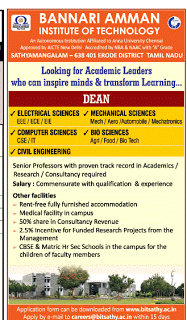 Bannari Amman Institute of Technology, Erode has advertised in the TIMES OF INDIA newspaper for the recruitment of Deans job vacancies. Interested and eligible job aspirants are requested to apply within 15 days from 17th August 2016. Check out further more details below. About College: Bannari Amman Group (BAG) is one of the largest Industrial Conglomerates in South India with a wide spectrum of manufacturing, trading and service activities. Manufacturing and trading include sugar, distillery, granite etc. The service sector has wind power energy, education etc. Group's net-worth exceeds US $270 million, with sales turnover crossing US $570 million. How to Apply: Interested and eligible candidates may send their duly filled application form to the following email ID or to postal address within 15 days from date of advt.